I've had somewhat of a disdain for the black navigation bar that Google gave us a while back ever since it's release. I do like it for it's easy access to Google apps but I hated it for having access to apps that I rarely ever use, and hiding other apps I do use very often in the More and Even More tabs. Well, I was listening to the EdReach Google Educast Podcast #090 this morning on my drive in to work and they mentioned a Google Chrome extension that calmed my nerves and made my day! Ala, Big G Black Bar Sorter! 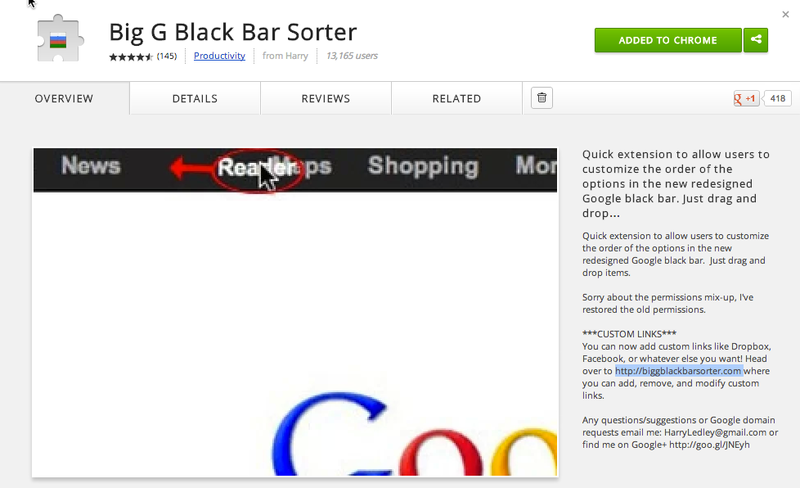 This chrome extension is very simple and easy to use and allows you to fully customize Google's black navigation bar. 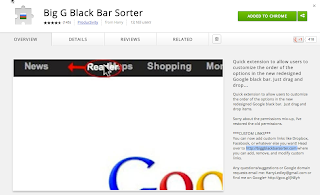 You can add any of the Google apps to the bar and now, with the most recent update, you can visit their website, http://biggblackbarsorter.com/ to add even more custom links that are not part of Google (i.e. Dropbox, Facebook, Twitter, etc.)! Check out my video on how the Big G Black Bar Sorter works! Video made with Camtasia 2! Thanks for watching! If you know of any other great Chrome Apps or Extensions, please share in the comments! Great job on your video, Michael! Two extensions I use a lot are Print Friendly & PDF and Select and Speak.